The rain is relentless. It’s as if through pressure and volume it’s trying to hose down the stubborn snow from the 1612 metre peak of Mt. Dajti which glowers darkly over the city. The 620 000 citizens huddle indoors. Only the nation’s hero, Skanderbeg, astride his mighty bronzed steed in the park which bears his name, unflinchingly defies the downpour. The city of Tirana, established by Sulejmar Pasha Bargani in 1614, languished till December 31 1925, before it was proclaimed as the permanent capital of Albania. Tourist brochures would have us believe that the city “is undergoing a major renovation…reinventing itself to become an energetic, vibrant, cosmopolitan city”. Esprit, Geog, Mango, Jumbo, Carrefour, Sheraton and others have already arrived to flash their seductive wares, enticing any who may be tempted to burn cash, quickly obtained through a variety of entrepreneurial skills way above that of the average wage earner who, if a job can be found, may receive officially $6 000 per annum. For would-be really high fliers there is the Sky Tower Rotating Bar. Money can at least buy temporary elevation above the chaotic clogged city arteries which are called streets down at ground level. Not even the torrential rain will clear or clean them completely. Mountainous Albania, perched precariously across a few kilometres of water from Italy in the West and abutting Turkey in the East, has for many centuries suffered the clash of competing religious allegiances. 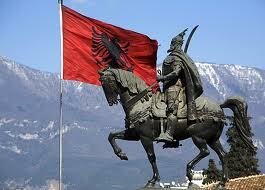 The aforementioned National Hero, Skanderbeg, justifiably encapsulates that history. When his country was attacked from the East by adherents of that ever expanding “Religion of Peace”, Islam, as a young boy he was carried off and retrained as a Janissary in the service of the Ottoman Sultan. He rose to high rank. But after decades of military engagements, he defected, returned and reclaimed his father’s castle, lost in an earlier battle in the hills adjacent to today’s Tirana. He then withstood 25 years of repeated sieges and furious attacks from his former Muslim overlords. After his death, the castle and those it protected, finally succumbed. Thereafter followed 500 years of enforced Muslim rule till independence was gained in 1912. Freedom for the long suffering Albanians was fleetingly short lived. In 1945, Communist dictator, Enver Hoxha fought his way to absolute unchallenged power. His rule was so severe that he broke first with the Soviet empire and later with that of China. Those regimes were not pure enough to be considered truly Communist. When he died in 1985 a typically majestic pageant was held to enthrone the dead dictator in his Mausoleum in the nation’s heroes’ cemetery. Five years later in 1992, when the bankrupt Communist State finally collapsed, Hoxha’s remains were unceremoniously exhumed and carted off to more modest environs along with other trappings of his era. History records that the only distinctive of his time, was his boast that Albania was the first and only officially declared Atheist State. But even that claim decayed faster than his despised corpse. Today religion is back in sufficient strength to make famous book publishing atheists in the West wince in dismay. On Boulevard Zhan D’Ark there is the recently constructed St. Paul’s Catholic Cathedral. Indeed that worthy Apostle did traverse this land on his many journeys. On Rr. Deshmoret e 4 Shkurti, west of Skanderbeg Square, immediately adjacent to the Ministry of Defence, is the new Resurrection of Christ Orthodox Cathedral. It’s anyone’s guess how many hundreds of millions of dollars were supplied by the Greek Orthodox authorities across the border to construct this impressive pile of gold braided masonry. Not to be outdone in reclaiming lost territory, Muslims with outside help, are busily constructing an Islamic university on the outskirts of Tirana. But really lasting renovation and revival is never measured by the grandiloquence of stone edifices. Jesus said that his church would consist of living stones which would be the changed lives of his followers. Precisely that is happening. Bereft of property or finances worth mentioning, a new type of Albanian is emerging. It is claimed there are now about 23 000 of them. Collectively, having recently secured government recognition, they are known as the Evangelical Alliance. Paradoxically during the process for legal recognition, government sources reportedly advised them that those most opposed to their being granted official recognition by government were not the Muslims, but the Roman Catholic and Orthodox hierarchies. This story is depressingly common in former Communist countries. In these small evangelical congregations composed of people from former majority faiths, of which Communism was just one, one hears the most dramatic testimonies of people who were searching for years for Truth and freedom. They speak of being lost in fathomless darkness. Finally they stumbled across people whose lives seemed totally different. These people had discovered –Jesus. The rain continues its ceaseless beating against the window. Perhaps after all it will dislodge some of the snow on the nearby mountains. It may even dilute some of the remains of the pestilential scourge of recent dictatorships. But nothing is going to stop the renewal of ancient Albania, especially through this new generation of “born again” true believers. Through the Old Testament prophet Isaiah, God declared that he “brings princes to naught and reduces the rulers of this world to nothing” (Isaiah 40:23). Seven centuries later Jesus said, “I will build my church and the gates of Hades will not overcome it” (Matthew 16:18). Albania is living testimony to both these truths.